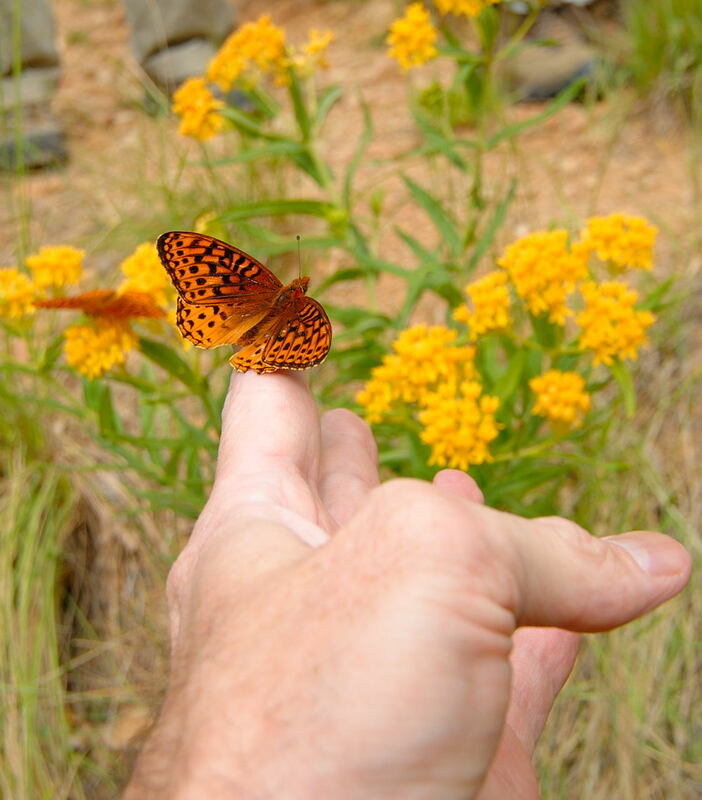 Left: Gene Hanson armed with modern butterfly hunting equipment with a butterfly on my index finger. Photo by Marceline VandeWater. 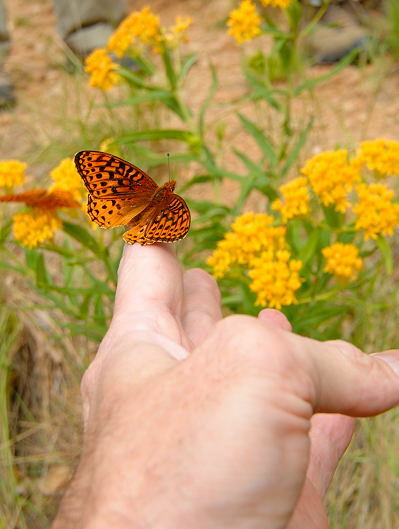 Right: My picture of that same butterfly. 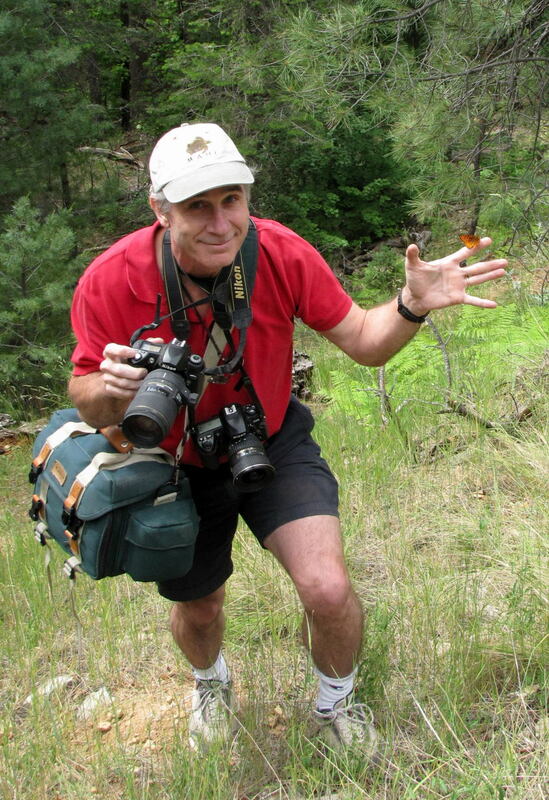 Though it is my intention to show butterfly and other insect pictures taken in nature, be warned there are two other ways that me and other photographers utilize. One is posed. That is when we have captured (hopefully temporarily) the bug and placed it in a setting to easily get a photograph. One pose method (which I have never used) is to keep a cooler at hand and temporarily freeze the insect so it can't move or doesn't move much. One natural way to exploit this effect is to photograph in the early morning - a technique that doesn't seem to work very well here in Phoenix! ;-) My pictures of butterflies emerging from their chrysalis' is another example of posing. The second one is captive. Photographing in a Butterfly Pavilion where the subjects are quite tame is a prime example. Photographing in a butterfly pavilion is practically effortless. So ... what difference does it make? To look at the final photograph, none at all. But I (and others) feel there is just a bit of dishonesty to present a picture without revealing that it was taken either captive or posed. And not to be overlooked is a bit of pride, too. 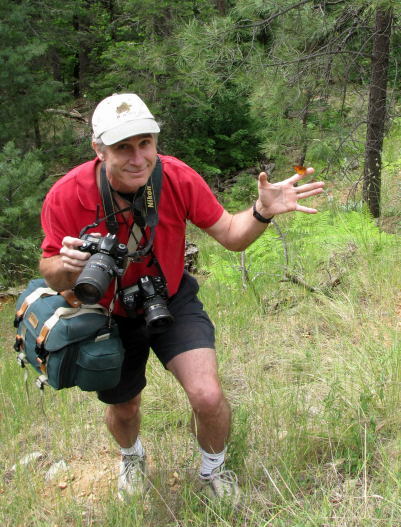 It is a lot more difficult to capture insect images in the wild! Therefore, I have tried to mark every photograph so you can tell how it was captured. What Equipment / What Skill? Occasionally I'm asked what equipment I use to capture these images. Almost all the photographs have the EXIF data retained so you can see exactly what camera, lens, and camera settings were utilized. (In order to see this data, you must download the image and open it with a photo editor or browser than can display this EXIF information.) One of the big reasons to ask what equipment is used generally drives photographers nuts: you're photographs are very nice, therefore you must have very good equipment! Well, on this point I plead guilty. These days I have a couple of Nikon DSLR's and a wonderful 150mm macro lens. But more modest equipment also works extremely well! Most of the smaller "point and shoot" digital cameras which had become ubiquitous (now seemingly replaced by phones) offer macro modes that will allow extremely close focus. Though I can assure you that equipment can be very important, it means nothing if you don't have the skill to go along with it. You need to know how to use your equipment - setting appropriate shutter speeds and aperture, and getting the focus point acceptable when the depth of field is razor thin in macro work. For this type of photography, you need to have skill in being pretty sneaky to not startle the skittish butterfly / dragonfly / other bug you're wishing to photograph. Clothing is an issue, too! I'd love to wear white during our 6 month Phoenix summers, but I find dark blues and reds seem to scare insects the least. Finally, photographing in the wild where you might have only seconds to capture your subject means hand holding your camera so you can quickly get into position. And hand holding means being steady enough! I chose the 150mm lens because I felt it was the longest lens I could reasonably hand hold without visibly seeing too much shake in the images. My short answer to the question, what's more important, skill or equipment - both are important!